The early 19th century was greatly populated by definitive answers; a result of the Enlightenment’s relentless focus on reason. On the other hand, it was also populated by the thought that answers are never definitive; a result of Romanticism and its focus on subjectivity. Amid this clash of opposites, there was Søren Aabye Kierkegaard, who chose not to choose any side in this contradictory framework and, although in favour of the Law of excluded middle, did not go to any of the extremes of his times. Having to choose to be either a Romantic or a rationalist, Kierkegaard chose to be none –nothing would be more suitable than a paradoxical position for an author whose life was dedicated to contradiction. Taking Socrates as his model, Kierkegaard seized the Greek philosopher’s task and made it his own life mission to use contradiction as a tool for the critique of actuality, a tool that is not to be resolved but to be appropriated. Kierkegaard’s stirring of a rethinking of his contemporary religious paradigm provides us with a model for the application –and a demonstration of the prevailing validity– of Socratic irony as a tool for the critique of our age’s objectively established conceptions and represents a plea to the acceptance that contradiction is a constituent part of life. Kierkegaard’s life can be compared to the throwing of a bowling ball. There is thorough preparation and careful consideration before the ball is thrown; before any movement is made, there is a significant dedication of time and effort to mentally prepare its trajectory and once the ball is thrown, it follows its pre-established path to the end –even if the end happens to be farther than expected. Similarly, Kierkegaard’s life work was largely defined during his early years. In his master’s thesis, The Concept of Irony, Kierkegaard developed the mind-set he would hold to throughout the entirety of his career. The thesis explored Socrates’ character and life in perspective of numerous philosophical trends of the early 19th century. This study had a constitutive role in Kierkegaard’s life, which is evidenced when, in his last years, he writes: “The only analogy I have before me is Socrates; my task is a Socratic task…” (M, 341). The Concept of Irony was, thus, Kierkegaard’s establishment of Socrates –and the negativity he represented– as a model for his philosophy. A major influence in Kierkegaard’s thinking were the ideas of the German philosopher Georg Wilhelm Friedrich Hegel, which he studied meticulously. Hegel’s exposition of Socrates identified in him the conception of a hitherto unimagined philosophical concept that provoked an irreversible change of paradigm in the Greek worldview. In Sophocles’ play Antigone, Hegel saw a portrait of pre-Socratic understanding of ethics and morals in the main character’s disregard for a newly established edict on the grounds of its incongruence to a higher, objective principle. Socrates’ mesmerising insight was, thus, the shift from this predominant culture of objective truths (given by deities or established in tradition) to the introspective world of subjective freedom, where the subject “must attain to truth through himself” (Lectures on the History of philosophy, vol. 1 p. 399). However, this advance was not consummated in Socrates –who attributed the responsibility over the judgement of important matters to a personal Daimon– but had to be further developed throughout the following ages. Socrates did not achieve this change by establishing novel dogmas; Hegel saw him as a purely negative figure, being the outcome of his work not the institution of positive doctrines but the sole negation of the existing ones. Drawing from this point, Kierkegaard constructs his idea of “pure irony” (CI, 253) as infinitely negative, that which is uniquely destructive and refuses to propose anything positive. By not actually suggesting any positive assertion, irony frees the ironist from any restraint to his position; hence “…the salient feature of irony is the subjective freedom” (CI, 253), the freedom the subject possesses to take any position he sees fit to fulfil irony’s purpose. Johan Ludvig Heiberg, one of Hegel’s followers, based on Hegel’s Theory of History and having Socrates’ case as his matrix, identified a pattern connecting ironists and paradigmatic shifts in humanity. Heiberg sustains that when scientific or philosophical advances undermine a society’s understanding of the world, a period of anxiety and uncertainty is established until the old “actuality is displaced by another actuality” (CI, 260). This period is brought about by the ironist, to whom “actuality has lost its validity” (CI, 259). Not being bound to custom and tradition, the ironist enjoys complete subjective freedom and assumes the spreading of awareness of the present crisis as his role; Kierkegaard names these as Prophetic individuals. These individuals do not create the new actuality —for they do not posit anything– but only precipitate the crisis. Being ahead of their time, they are commonly misjudged and end up becoming a “sacrifice that the world process demands” (CI, 261). Still following Hegel, Kierkegaard adopts the German philosopher’s view on Johann Gottlieb Fichte’s theory of subjectivity. Fichte, drawing on Kant’s concept of man as the measure of all things, placed a strong emphasis on the subject and his sensorial and emotional perceptions, alleging these to be the key attributes to affirm one’s individuality. Fichte’s theory was the basis for German Romanticism and its focus on subjectivity, which placed individual interpretation higher than collective judgement in all instances. Hegel was swift to point out the flaw in Fichte’s theory, noting its failure to perceive rationality as the uniting feature of human race. Bearing that in mind, Hegel opposed Romantics’ attempts to establish arbitrary rules based on their individual understanding; he believed the subject should arrive at the truth by himself, but this truth is not contingent on the subject but universal –men’s shared rationality would warrant the arrival at a common truth. Following from that, Hegel saw philosophy’s goal as the revelation of that truth and censured Socrates for stopping at the aporetic stage. At this point Kierkegaard’s and Hegel’s views begin to diverge; Kierkegaard saw Socrates’ function as that of the pure ironist, the prophetic individual, not positing anything but uniquely negating. For this reason, Kierkegaard was highly critical of Hans Lassen Martensen, a Hegelian professor of his who encouraged his students to doubt everything and afterwards go a step further than Socrates, stating a positive concept. Kierkegaard considered it to be preposterous, for he was establishing ideas as empty as those he had just disestablished, and also dangerous, for Martensen’s indiscriminate doubting led to a deconstruction of sound concepts whose absence would lead to despair. Kierkegaard’s critique took the form of a satirical novel, De omnibus dubitandum est, and he also identified the same pattern in Goethe’s Faust and in the Greek Sophists. These are the leading ideas of Kierkegaard’s life work, guiding it from start to finish. During his first authorial period, he wrote a series of signed and pseudonymous books, both groups dealing with similar themes, the former being simpler and aiming at the common citizen, and the latter having a scholarly tone and focusing on highly educated individuals. His first publication under a pseudonym was Either/Or, which was a critique of Romanticism’s eminent irony, the indiscriminate critique of all society which “necessarily ends in an absence of all content, in a moral nihilism.”(Poul Martil Moller, “Om Begrebet Ironie”). By putting two drastically different characters in juxtaposition and not offering any conclusion to what should be understood of it, Kierkegaard made a clear allusion to Socrates’ aporia. Afterwards, in Fear and Trembling, Kierkegaard discusses faith and states the profoundly paradoxical character of Christian belief. It was the first step towards his goal of establishing contradiction as a necessary attribute of Christianity and to use it as a tool for the critique of religious institutions. Fear and Trembling was followed by The Concept of Anxiety, where the idea of appropriation was introduced, which is “to translate the achievement of scientific scholarship into personal life, to appropriate it personally.”(CA, 328). Then came Prefaces, where just like Socrates, the author claims to know nothing and uses this to criticise the current philosophical views. It was followed by Stages on Life’s way, a problematization of the forgiveness of sin, which again wound up simply posing a contradiction but not proposing any solution to it. During this time, a series of signed works were published alongside the pseudonymous ones and it all culminated in the Concluding Unscientific Postscript. 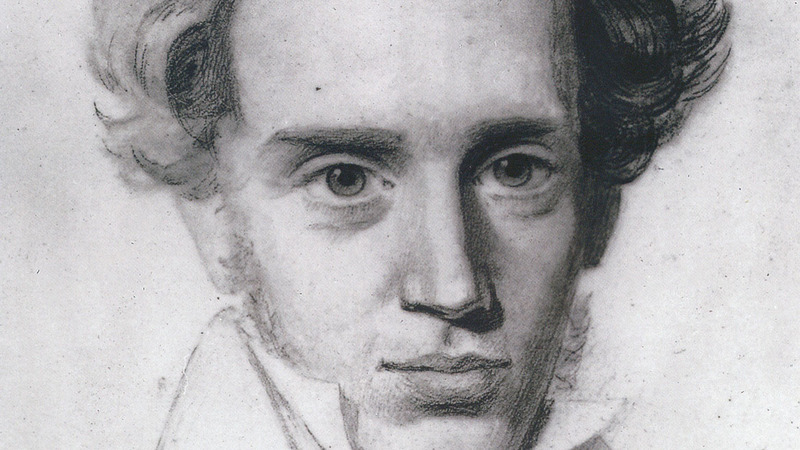 The Postscript revealed Kierkegaard’s intention with all his works, explaining that it was not his will to construct dogmas but only to point out the contradictory character immanent to Christianity and foster the individual quest for what is true for oneself. It marked the end of Kierkegaard’s first authorial period. Kierkegaard’s second authorial period was dedicated to a severe attack on the Danish church and, just as before, he uses the Socratic concepts of irony, ignorance, negation, aporia, maieutics and Socrates’ role as the gadfly to effect this critique. Kierkegaard saw in Socrates an example of prophetic individual and saw contradiction and paradox as the result of his ironic action. He identifies himself with Socrates and labours to bring to light the inherent contradictions of life. However, it must be noted that Kierkegaard’s paradoxes are different from the contradictions Socrates faced. Socrates saw that proposed definitions did not represent a concept accurately –excluding instances of it or including unrelated cases– and that established the contradiction; Socrates’ contradictions were discrepancies between a concept and its translation into language in a fixed definition. Thus, contradiction only appeared with the positing of a definition. The aporetic result of dialogues was an attempt to avoid being contradictory by conforming to not finding this perfect definition. In Kierkegaard’s themes, contradiction does not only appear between the concept and its worded representation but also within the concept itself. Socrates was concerned with ideas like beauty, piety, justice and virtue, which although difficult to explain are notions of which one have a reasonably plain perception. Conversely, Christianity is contradictory in Sich (in itself). The infinite in the finite, the eternal in the temporal, sin as a disregard for the universal and pious faith as a teleological suspension of it, all this evidences the inherently paradoxical character of Christianity, which establishes a contradiction even before the consideration of any positive description of it. Kierkegaard’s greatest appeal is for his readers not to try to solve the contradiction but to embrace it and keep it in mind as a never-ending critique of actuality. More than a hundred and fifty years have passed since Kierkegaard’s attack to the church and his insight holds its validity now more than ever before. In an age where change occurs at an unprecedented speed, Heiberg’s pattern of substitution of actuality can be felt by individuals in their own lives. As actualities rapidly pass away and new ones come in their stead, to hold onto a firm set of convictions becomes ever harder, and, without these, individuals are placed in imminent danger of falling prey to a state of everlasting alienation, being constantly stripped of fundamental principles. To avoid this despairing condition, one must take a stand and adopt a philosophy that holds true for oneself. However, this same condition creates a wariness of new ideals –that they will reveal themselves to be as empty as the former ones– and that is exactly where the keeping in perspective of the contradictions intrinsic to concepts performs its critical role. The paradox will serve to judge actuality, through it ideas will be accepted or disregarded and in this process the individual will construct his own understanding of the beliefs shared in the community of our rationality. It is with this paradoxical criticism that we –like Kierkegaard in his time— face the uncertain future with boldness and the assurance that if our thinking is right, like a bowling ball thrown we will stay on track even if the end happens to be farther than we expect.